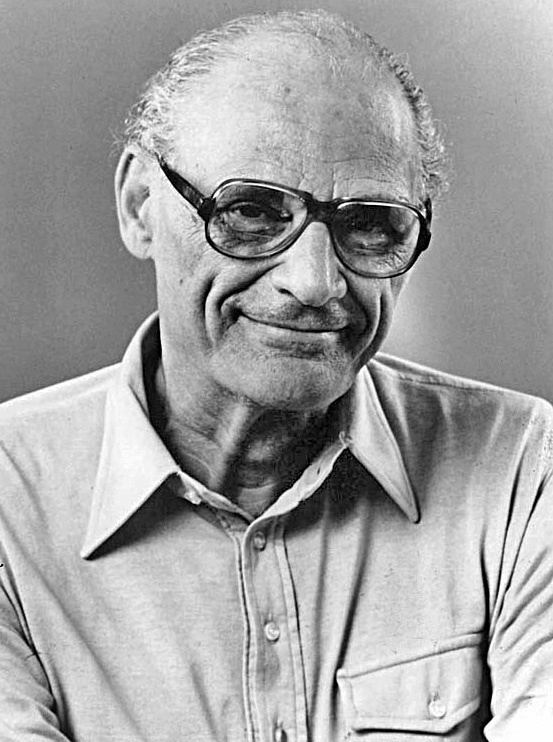 Arthur Asher Miller (October 17, 1915 – February 10, 2005) was an American playwright, essayist, and figure in twentieth-century American theater. 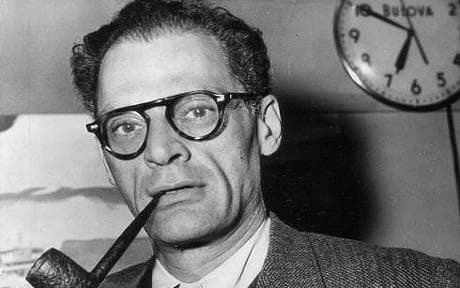 Among his most popular plays are All My Sons (1947), Death of a Salesman (1949), The Crucible (1953) and A View from the Bridge (1955, revised 1956). He also wrote several screenplays and was most noted for his work on The Misfits (1961). 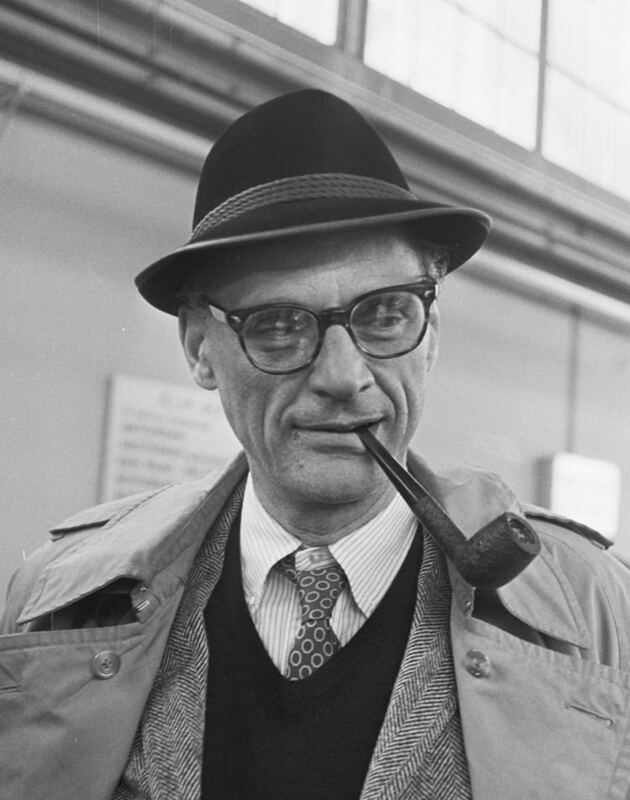 The drama Death of a Salesman has been numbered on the short list of finest American plays in the 20th century alongside Long Day's Journey into Night and A Streetcar Named Desire. Miller was born on October 17, 1915, in Harlem, in the New York City borough of Manhattan, the second of three children of Augusta (Barnett) and Isidore Miller. Miller was of Polish Jewish descent. His father was born in Radomyśl Wielki, Galicia (then part of Austria-Hungary, now Poland), and his mother was a native of New York whose parents also arrived from that town. Isidore owned a women's clothing manufacturing business employing 400 people. He became a wealthy and respected man in the community. The family, including his younger sister Joan Copeland, lived on West 110th Street in Manhattan, owned a summer house in Far Rockaway, Queens, and employed a chauffeur. In the Wall Street Crash of 1929, the family lost almost everything and moved to Gravesend, Brooklyn. As a teenager, Miller delivered bread every morning before school to help the family. After graduating in 1932 from Abraham Lincoln High School, he worked at several menial jobs to pay for his college tuition. In 1940, Miller married Mary Grace Slattery. The couple had two children, Jane and Robert (born May 31, 1947). Miller was exempted from military service during World War II because of a high-school football injury to his left kneecap. 1940 was also the year his first play was produced; The Man Who Had All the Luck won the Theatre Guild's National Award. The play closed after four performances with disastrous reviews. In June 1956, Miller left his first wife, Mary Slattery, whom he married in 1940, and married film star Marilyn Monroe. They had met in 1951, had a brief affair, and remained in contact since. Monroe had just turned 30 when they married, and having never had a real family of her own, was eager to join the family of her new husband. Miller later married photographer Inge Morath in February 1962. She had worked as a photographer documenting the production of The Misfits. The first of their two children, Rebecca, was born September 15, 1962. Their son, Daniel, was born with Down syndrome in November 1966; he was institutionalized and excluded from the Millers' personal life at Arthur's insistence. The couple remained together until Inge's death in 2002. 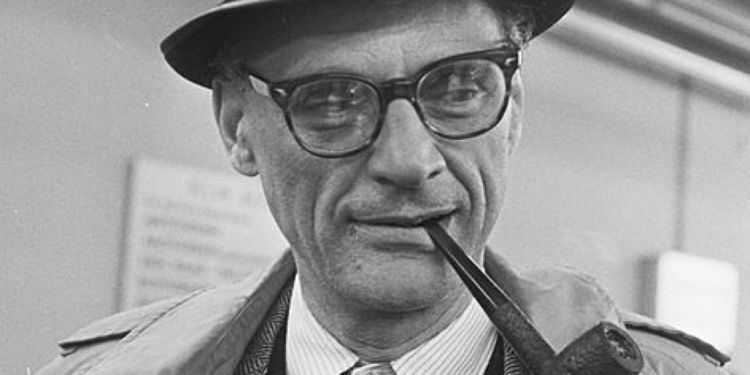 Arthur Miller's son-in-law, actor Daniel Day-Lewis, is said to have visited Daniel frequently, and to have persuaded Arthur Miller to reunite with him. In 1964 After the Fall was produced, and is said to be a deeply personal view of Miller's experiences during his marriage to Monroe. The play reunited Miller with his former friend Kazan: they collaborated on both the script and the direction. After the Fall opened on January 23, 1964, at the ANTA Theatre in Washington Square Park amid a flurry of publicity and outrage at putting a Monroe-like character, called Maggie, on stage. Robert Brustein, in a review in the New Republic, called After the Fall "a three and one half hour breach of taste, a confessional autobiography of embarrassing explicitness . . . there is a misogynistic strain in the play which the author does not seem to recognize. . . . He has created a shameless piece of tabloid gossip, an act of exhibitionism which makes us all voyeurs, . . . a wretched piece of dramatic writing." That same year, Miller produced Incident at Vichy. 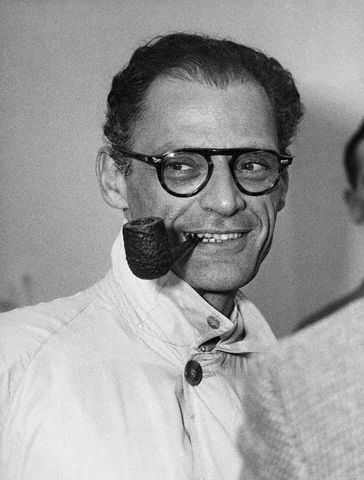 In 1965, Miller was elected the first American president of PEN International, a position which he held for four years. A year later, Miller organized the 1966 PEN congress in New York City. Miller also wrote the penetrating family drama, The Price, produced in 1968. It was Miller's most successful play since Death of a Salesman. During the early-mid 1990s, Miller wrote three new plays: The Ride Down Mt. Morgan (1991), The Last Yankee (1992), and Broken Glass (1994). In 1996, a film of The Crucible starring Daniel Day-Lewis, Paul Scofield, Bruce Davison, and Winona Ryder opened. Miller spent much of 1996 working on the screenplay to the film. Miller died of bladder cancer and congestive heart failure, at his home in Roxbury, Connecticut. He had been in hospice care at his sister's apartment in New York since his release from hospital the previous month. 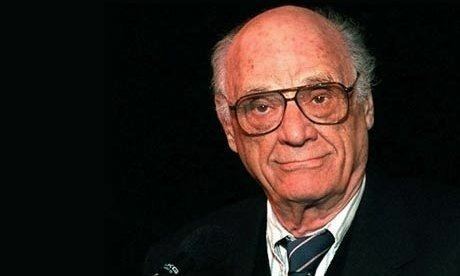 He died on the evening of February 10, 2005 (the 56th anniversary of the Broadway debut of Death of a Salesman), aged 89, surrounded by Barley, family and friends. He is interred at Roxbury Center Cemetery in Roxbury. Maggie is a character that appears in Arthur Miller's partially autobiographical play, After the Fall. She is both one of his most criticised and controversial characters, and one of his most famous ones. She is a thinly veiled version of Marilyn Monroe, Miller's former wife, and thus her suicide attempts after her and Quentin's divorce, and her depression is from reality. This is one of the reasons that reviews upon its first release were generally negative, owing to the similarities between fact and fiction. However, academic scholars find her to be one of the best, if not the best, of Miller's creations, as the play presents readers with a superb portrait of a woman facing a mental crisis. It also shows Monroe in comparison to the reasons for her marriage to Miller- for example, the fact that Miller took her seriously, and was ready to treat her as more than just an object, like everybody else. Miller also highlights his own feelings after Monroe's death by showing Quentin's, and his regret that he had been unable to save her from herself.